AM Cardio for Fat Loss W/ 25g Casein vs. 25g Whey Isolate, 25 g Maltodextrin Preload, or Truly Fasted – What’s “Best”? 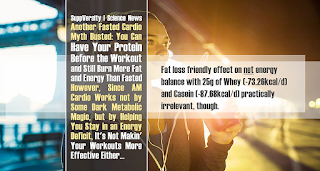 Don’t believe a word when someone tells you that a new study would show that you can burn extra body fat if you consume a casein shake before your (by then no longer fasted) AM cardio workouts. While the scientific evidence doesn’t seem to confirm the superiority of fasted AM cardio (learn more), there’s no doubt that it can help you shed body fat if the energy you expend on treadmill ergometer, or rowing machine helps you sustain a >10% energy deficit over the next 24h. What is highly debated, though, is whether you got to take precautions in form of protein powders (or BCCAs) to protect your muscle from falling apart. … How’s that? Well, in their study, the US scientists write that “[p]rotein consumption before fasted moderate-intensity treadmill exercise significantly increased post-exercise energy expenditure compared to maltodextrin ingestion and tended to be greater than control” (Gieske 2018). 25g protein in form of 25 g of similarly colored and flavored whey protein isolate, of casein protein (real micellar casein, no cheap caseinates), and compared the effects of this protein preload to 25 g of maltodextrin, or a non-caloric control. After the ingestion of the supplement, the participants sat quietly for 30 min before completing a standardized warm-up protocol consisting of whole-body dynamic movements that lasted approximately ten minutes. Hence, the actual testing session, a medium-to-low intensity 30-minute ‘cardio’ session on the treadmill (55% heart rate reserve) took place 40 minutes after the bolus ingestion of casein, whey, maltodextrin or the zero-calorie control drink. Figure 1: Acute exercise-induced (kcal total on the primary axis) and extrapolated post-exercise 24h energy expenditure (kcal/kg/day on the secondary axis) in the study by Gieske et al (2018). In conjunction with the 15 minutes, it took for the subjects to get their resting metabolic rate post workout (re-)assessment started, the data in Figure 1 was thus generated at roughly T=60 minutes in the early postprandial phase (note: don’t forget that the exercise itself will have slowed down the digestion significantly). Dietary standardization in form of a replication of the average four-day diet composition reported by participants prior to Visit 1 was as follows: 2446 ± 800 kcal (28.44 ± 9.30 kcal/kg), 132 ± 56 g (1.53 ± 0.65 g/kg) protein, 235 ± 101 g (2.73 ± 1.17 g/kg) carbohydrate, 99 ± 37 g (1.15 ± 0.43 g/kg) fat on the remaining test visits was successful. Exercise standardization as measured using one-way ANOVA revealed no significant differences (p = 0.743) in intra-exercise heart rate, rating of perceived exertion (p = 0.985), or oxygen consumption (p = 0.993) between conditions, suggesting that intensity was sufficiently standardized across all testing sessions. And the pre-treatment and pre-exercise rates of energy expenditure (Absolute: 1873 ± 189 kcal/day, Relative: 22 ± 2 kcal/kg/day) were not significantly different across conditions (p > 0.99). About the trend towards statistically significant effects of whey vs control the scientists write that it “is notable, as 73% of the participants during the WPI condition exhibited a change in REE toward the direction of significance” (Gieske 2018 | note: the success rate in terms of being able to observe beneficial effects on energy expenditure was yet highest in the casein group, where 9 out of 11 subjects vs 6 out of 11 participants in the WPI group saw significant increases). The researchers calculated within-condition effect sizes for each nutrient (WPI, CAS, and MAL) – with effect sizes for WPI and CAS being moderate to large compared to MAL and CON. So far, so good, now for the bad news: With a total intra-exercise EE of 345 ± 31 kcal, 362 ± 32 kcal, and 349.17 ± 70 kcal, the increase in energy expenditure compared to the control trial (293 ± 37 kcal) is below the amount of energy, circa 100kcal, in the protein/carbohydrate supplements. 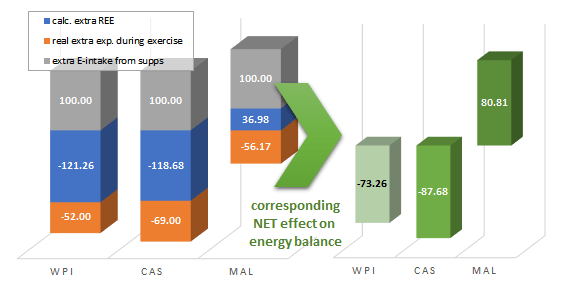 Figure 2: Individual effects on energy intake and expenditure (left) and corresponding net effect (right). You can see that very well if you check out the subjects’ energy balance right after the workout (Figure 2, left); and things don’t look much better if we assume that the post-workout increase in energy expenditure persists, i.e. that the scientists’ calculated “increase in energy expenditure” remains stable (or whatever they assumed it did, when they used the data from 20-25 minutes after the workout and extrapolated it to 24h), and calculate the effect of consuming whey, casein, or maltodextrin on the net energy balance. Do not get me wrong, though… AM cardio aids fat loss! No, no, and no: It does not make a difference! It makes no difference if you consume whey or casein or any other form of protein before your low-to-moderate intensity AM cardio. While the insulin spike from whey may blunt the fat oxidation during the initial 5 minutes of your training that’s not relevant for your real-world fat loss. The same goes for the 14.42kcal difference in the NET energy balance between whey and casein and the overall difference to control, of which we (a) do not even know if those 75-90kcal wouldn’t simply be compensated for at lunch or dinner, and/or (b) nullified by potential compensations in REE later in the day (which were not measured). So what’s the verdict, then? In the absence of practically relevant changes in energy expenditure, let alone net energy balance, it would be stupid to expect to lose more body fat if you consume 25g of either whey or casein before your by then no longer “fasted” AM cardio sessions. What’s more, the measurable, but overall small and medium effects (Cohen’s d) of casein and whey protein isolate on the subjects’ intra- and post-workout total fat oxidation and respiratory exchange rate (ratio of carbohydrates to fats that are used to fuel your metabolic requirements), respectively, are likewise irrelevant when it comes to the alleged “fat burning effects” of AM cardio. In the end, it’s just a zero-sum-game! One of which I can guarantee, however, that it is going to be completely misinterpreted on the average bodybuilding and physique boards, though… especially with the scientists’ imho somewhat unfortunate emphasis on the “significantly increased rates of post-exercise fat oxidation and energy expenditure with casein” and “the reduction in […] total fat oxidized during the exercise bout [with WPI preingestion] compared to casein” in the first paragraph of the discussions | Leave a comment on Facebook! Gieske, et al. (2018). “Metabolic impact of protein feeding prior to moderate-intensity treadmill exercise in a fasted state: a pilot study.” Journal of the International Society of Sports Nutrition 15:56.